In addition to being a heartwarming sight, there was also a critical reason for that particular grouping: socialization. The older pair, Tiger and Fawn, are members of the Forgotten Kitten Project recently featured on the Kitten Wire. They are still shy around most humans, requiring a slow approach and some patience. The younger pair, sisters Miranda and Liara, are about as confident and human-oriented as they come. They greet you with meows, quickly jump in laps and purr loudly when held. Liara and Miranda played confidently while Tiger and Fawn watch on, learning from their behavior. So why did Cat Town group these two very different pairs from different litters together in a studio space? The answer is modeling. Shy cats benefit from watching the behaviors of confident cats. And proving our theory true, Fawn, the Russian Blue girl who has been slow to allow many pets, had a major breakthrough after just a few days in the presence of the always outgoing younger pair. On multiple occasions recently, beautiful Fawn eagerly accepted cheek scratches, chin runs and full-body pets with visitors. Fawn rolling over for cheek and chin scratches. 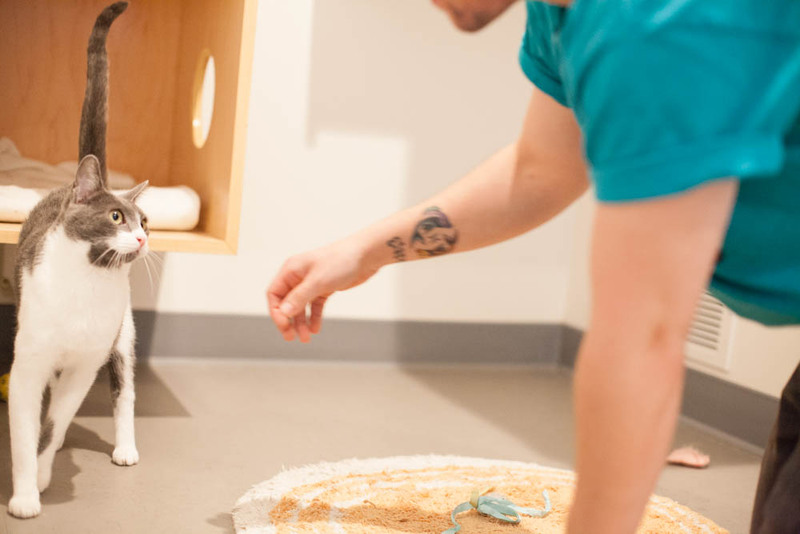 This breakthrough is exactly why Cat Town strategically mixes shy cats and kittens with more confident ones in its main adoption center and, when possible, in its studio spaces. So how did Cat Town come to have Miranda and Liara, two confident kittens? They benefited from Cat Town's early intervention to alleviate shelter overcrowding during this year's kittens season. They were just a couple months old upon arrival to their Cat Town foster home, where they got specialized attention before landing in our adoption center. And if you remember from our recent Kitten Wire dispatch, Tiger and Fawn, on the other hand, were rescued as members of the Forgotten Kitten Project after missing out on early socialization with humans during the optimal first months of their lives. Grouping the shyer ones with outgoing kittens has already helped push them out of their shells. They see the kittens jump in human laps, lean in for pets and confidently move about with multiple visitors per day. Tiger made earlier breakthroughs and is particularly attached to a member of the Cat Town crew. The combination of social feline role models paired with dedicated human interaction has proven to be a winning success. And now we are celebrating Fawn's breakthrough, knowing she has an incredible capacity to gain confidence, as we've seen in so many forgotten kittens before. Tiger and his favorite staff member, Camden, getting ready for pets! We are happy to report that Miranda and Liara have found their new family and have already gone home. Now, we are just waiting for the right person to come along to help Tiger and Fawn keep blossoming into the great companions we know they will be. Most immediately, we're hoping to get them placed with a dedicated foster, someone who knows how far they've come and can help them continue growing on their way to adoption. Reach out to our staff at info@cattownoakland.org to learn more about fostering or adopting. First visit to the Cat Town blog? Learn more about our Forgotten Kitten Project in our regular Kitten Wire dispatches. Newer PostVolunteer of the Month: Cammane W.